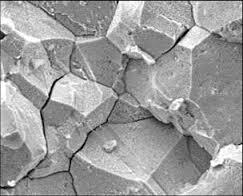 Hydrogen embrittlement is a serious phenomenon that affects the strength and performance of materials in application. This becomes particularly important when fastening hardware fails to perform as intended due to this condition. Minimizing risk should always be a consideration when establishing product specifications. Understanding the causes and steps to mitigate its occurrence is beneficial to customers (end users), suppliers, and manufacturers. Hydrogen embrittlement simply is the absorption of hydrogenatoms into steels that have high tensile strength or which have been surface hardened. Various product standards specify the critical hardness at ~ 40HRC, meaning parts exceeding these hardnesses are more susceptible to hydrogen embrittlement. Other standards specify even lower hardnesses. This absorption typically affects the grain boundaries of the material making them more brittle and unable to withstand the applied stress of the application resulting in a delayed failure of the fastener. Sources of hydrogen can be present during manufacturing processes or from the environment to which the product is exposed during service. Either way, the outcome will be similar (i.e., failures during or shortly after installation or delayed failures in service). For fasteners, a predominant source of hydrogen absorption occurs during electrochemical processes, such as acid cleaning and electroplating. To substantially reduce the risk of parts failing due to hydrogen embrittlement, design engineers should understand the environment where parts are being used and consider design specifications for the product itself. The ultimate goal is to adjust either the mechanical properties, risky coating practices, or both. Where possible, the tensile and/or hardness should to be lowered to a level where hydrogen absorption will not affect the performance of the part in application. Additionally, serious consideration must be given to changing current practices of specifying electroplating for at-risk parts. There are, in fact, a number of American and International consensus standards that strongly discourage the use of electrodeposited finishes for such product where the specified strength levels are within critical hardness range. There are many alternate finishes that can be applied to hardware where hydrogen is not present during application. Good design practices can aid in avoiding potentially significant problems and costs from repair or replacement activities.